The Kaufmann STABILIZER ™ (patent applied for) heeling magnet system is easy to adapt to a wide range installation situations. The typical heeling magnet problem is that the area beneath the steering console area, where the compass must be located, is crowded with many items: helm controls, hydraulic systems, electrical wiring and junction boxes, general stowage, etc. The Kaufmann STABILIZER ™ eliminates the long and awkward vertical tube commonly associated with traditional heeling magnet systems. The entire system is very compact. In its simplest form, the STABILIZER™ is an array of of magnets joined by a plastic bushing which is fitted onto a threaded rod. By rotating the array, the magnets can be moved up or down the rod with great precision and the magnetic field thus generated at the compass can be corrected with great control. After setting the array to the correct position, the magnets are then firmly secured by tightening the nuts above and below the magnet array, expanding the bushing against the rod. The STABILIZER™ can be mounted beneath the compass as in figure 2. Or inverted, on top of a fluxgate compass box as in figure 3. 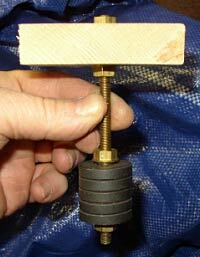 Or it can be mounted inside a block of wood, with the compass mounted on top of the block as in figure 4. Figure 4 shows the system as it is installed on a CG 140' ice-breaking tug. The steering console is on this ship is STEEL, which would make a traditional tube-type magnet system ineffective, as the steel box would act as a shield to distort and nullify the effect of the heeling magnet if the heeling magnet were inside. The system can also be installed inverted. Figure 5 shows the STABILIZER™ on the overhead in the wheelhouse of a small research ship.